And a few players have been checking in on Kang, too. 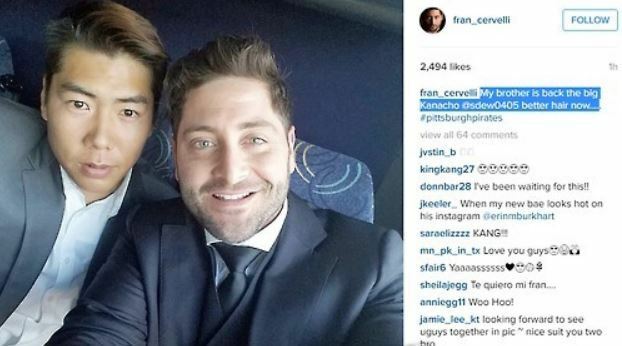 He said outfielder Andrew McCutchen, the face of the franchise, has even sent him text messages in Korean -- likely after using an online translation service -- while outfielder Starling Marte and catcher Francisco Cervelli have also been in touch, telling Kang to come join them again quickly. Kang also said he misses the support from fans in South Korea, who, because of the time difference, mostly watched the Pirates play in the morning on their way to work or school. "I loved hearing fans say they always watched me play on their commute," Kang said. "Now, fans tell me they wish they could see me play again in the morning." After training on his own for months in his hometown of Gwangju, some 350 kilometers south of Seoul, Kang is hoping to put his playing career back on track in the Dominican Winter League next month. Kang said he can hardly wait to return to live baseball action. Though his future beyond the Winter League -- which is usually for prospects seeking playing time or big league veterans rehabbing injuries -- is still murky, Kang said he wants to focus on the task at hand and playing well in the Dominican Republic, so that at least he'll be ready to hit the ground running once he rejoins the Pirates. The Pirates could certainly have used Kang's services. After winning a National League wild card spot in 2013, 2014 and 2015, they will miss the postseason for the second straight season. At 68-83 after losing their sixth straight on Monday (local time), the Pirates are 16 games back of the first-place Chicago Cubs in the NL Central. The Pirates rank in the bottom third in the NL in runs scored, batting average, home runs and slugging percentage this year. Note that Kang hit 15 homers in 126 games as a rookie in 2015, when he finished third in the NL Rookie of the Year voting, and had 21 more in 103 games last year. The sense of helplessness has been gnawing at Kang, as he's been reduced to watching it all from South Korea. "I don't know how much of a difference I would have made, but still, it's been frustrating to watch the club lose," Kang said. "Even when you lose, it's always better to do it as a team. I wished I could have helped the team. I am sorry to my teammates and fans (for the drunk driving incident)." But amid his off-field issues, the Pirates have placed Kang on the restricted list, which is for players who are unable to play for non-injury reasons, such as arrests or family matters. Kang will not be paid or earn major league service time while on this list. The front office has kept in touch with Kang. The Pirates even shipped him a pitching machine that throws fastballs and breaking balls so that Kang could stay sharp. Kang said he's really grateful for all that the Pirates have done for him, and he's that much more motivated to play well in the Winter League. "I am really thankful that they tell me they still need me," he said. "I want to become a better person and a better player." Kang has also spoken from time to time with manager Clint Hurdle. He'll reportedly visit the Dominican Republic to see Kang, who said, "It'll be so great to meet him again." Kang's drunk driving robbed him of a chance to play against some close friends from his Korea Baseball Organization days. Los Angeles Dodgers' left-hander Ryu Hyun-jin returned from shoulder and elbow injuries this year, while Hwang Jae-gyun, a former KBO teammate of Kang's, had a cup of coffee with the San Francisco Giants in his first US season. Ryu also made one start against the Pirates in August. "It would have been nice to have faced them," Kang said. "We've talked to each other a little bit. But since we're all very close, we still understand each other without saying a great deal." There's so much to like about playing in the big show that Kang wants some of the younger KBO players to enjoy the same experience. Notably, Kim Ha-seong, Kang's heir apparent as the power-hitting shortstop for the Nexen Heroes, could be the next South Korean position player to make the jump in Kang's opinion. Kim, just 21, was batting .297 with career highs of 23 home runs and 112 RBIs through last weekend's action. He had 20 homers and 28 steals last year, and sits four steals away from joining the 20-20 club again this year. He will need four more full seasons to be eligible for posting for major league clubs, and has already drawn interest from big league talent evaluators. Nexen manager Jang Jung-suk has said Kim is better at 21 than Kang was at the same age, and Kang readily admitted, "Kim Ha-seong is so good I can't even compare to him." "I would strongly recommend that he give (the major leagues) a try," Kang added. "The important thing is just how much more he's willing to work and not stay satisfied. If he continues to improve, he should be good enough to play in the majors." Kang said he only began preparing for a big league career belatedly, and said Kim should start his process much earlier, in terms of getting his body and mind ready for a new challenge and learning English well ahead of time. One thing Kang said he had on his side was confidence. In 2016, he became the first Asian infielder to hit 20 or more home runs in the majors. Some outfielders from the continent have put up some power numbers, but infielders from South Korea, Japan and Chinese Taipei have typically been smallish, slap hitters with limited pop. Kang had been one of the premier sluggers in the KBO, highlighted by his first and only 40-homer season in 2014. Though he has yet to match his gaudy KBO numbers, Kang didn't suffer as precipitous a drop in his production as some had anticipated.